This is a field and computer laboratory exercise that introduces undergraduate students, advanced high school students, and members of the general public to using Google Earth, GPS, aerial imagery, and an online illustrated vegetation and tidal marsh environment identification guide to distinguish and map vegetational and physical environmental zones within a salt marsh. They also learn about the physical and ecological relationships between these environments. Students use GPS devices to collect field data as waypoints and tracks, and upload the data to computers in GPX format. They learn to open the data in Google Earth along with infrared and color aerial imagery, and use the GPS data to interpret the aerial imagery. Using Google Earth tools, they draw polygons to demarcate the boundaries of environmental zones in the wetlands that they recognize on the imagery. The students and instructors also take photographs of the students in each of these environmental zones and embed the photographs into information balloons of placemarks in Google Earth. The exercise was originally designed for use at Flax Pond, a salt marsh on the North Shore of Long Island. However, it can easily be adapted for use in other tidal marshes, and can serve as a template for developing similar activities to be conducted at other locations in which aerial imagery can be used to distinguish various forms of land cover. This exercise is appropriate for a wide variety of audiences, and can be scaled and adapted for college undergraduates, high school students, and the general public. It requires periods of several hours in the salt marsh during low tide, where conditions can be wet and muddy. It also requires at least several hours of time for using Google Earth and a web browser. Internet access is essential. Ideally, the exercise should be performed over a period of several days, so that participants can have multiple opportunities to collect field data as needed. The field work must be scheduled for periods that avoid high tide. Consult tide tables, and keep in mind that the time of low tide in a salt marsh with a single inlet, such as Flax Pond, may be delayed by an hour or so with respect to the low tide in the adjacent body of water that serve as the source of the tidal flow. Weather is also an important factor in determining appropriate times for performing field work, and thunderstorms and times of storm surge need to be avoided. Summer and fall are the best times of the year for this exercise, since these seasons are when the water is at its warmest. The exercise was originally designed for Flax Pond, a salt marsh on the North Shore of Long Island, and some of the instructional materials, such as the electronic map overlays and sample data, are specific to that site. However, the same or similar techniques can be used in other salt marshes. The online plant identification guide, the classification scheme, and the data sheets can be used for other tidal wetlands sites. The techniques can also be adapted for other types of wetlands or environments, but would require that new classification schemes be provided to the students to reflect the environments that are identifiable in the field and on the aerial imagery available for those particular sites. This exercise was originally used with a group of high school and college students and members of the general public during the summer of 2008. The participants worked in teams of 4 or 5 and each individual devoted approximately 12 hours of time to the project. The instructors should use this guide and the Google Earth Tip Sheet to become familiar with Google Earth prior to the activity. The following file contains sample data that the instructors can optionally provide the students as examples of the type of data that they will be creating. 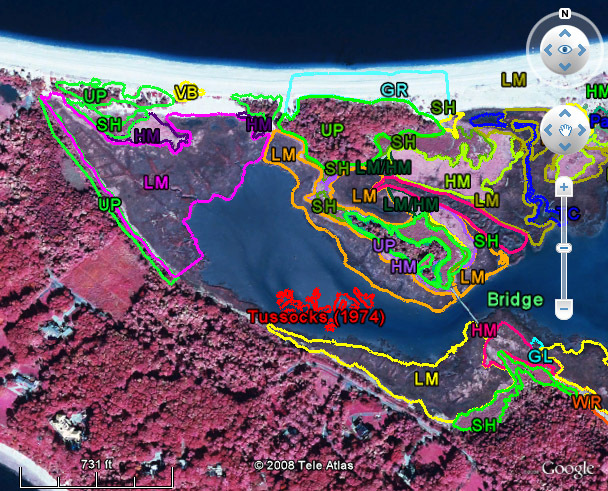 The data includes sample GPS points, polygons and labels that were created by students and slightly modified by instructors during the summer of 2008, and boundaries of the four team field areas that were used that summer. It also contains three aerial photographs of Flax Pond as ground overlays so that they can be superimposed on the Google Earth imagery. The imagery is from the New York State Department of Environmental Conservation and consists of a true color aerial from 2004 and infrared images from 1974 and 2006. Whether or not the sample data is provided to the students, the instructors should examine it in Google Earth to become familiar with the type of data that the students will be creating. After conducting the PowerPoint presentation, have the students open the Flax Pond Review File for Google Earth (KMZ File 1.3MB Oct2 08) and try to answer the questions in the placemark information bubbles. This activity can be conducted as a guided discussion. Note: Equipment must be protected from salt water. On Long Island and in other regions, participants need to recognize and avoid poison ivy. Students should work in groups of three of four in the field and in the computer laboratory. In the field, each group should be accompanied by at least one adult for guidance and for safety purposes. The adult needs to be knowledgeable about using the GPS devices, must be familiar with the data sheets and instructions given to the students, and must recognize the plants and environmental zones in the marsh. If only one adult accompanies any of the groups, an arrangement should be made for communication with other adults in the field in case it becomes necessary for any of the students to be brought back to the laboratory due to injury or another problem. In the laboratory where the students process their data, several adults should be present who are familiar with how to upload GPS data and how to use Google Earth. If the students are expected to add photography to to their Google Earth data, the adults need to know how to upload photographs from the digital cameras, and how to process them in order to either resize them in preparation for embedding in placemark balloons, or how to upload them to a hosting service such as Flickr. If this is the case, an account for the hosting service should be created in advance. Polygons demarcating environments at Flax Pond on an infrared imagery overlay for 2006 from the New York State Department of Environmental Conservation in the Google Earth 3D Viewer. This activity as well and various governments and organizations concerned with wetlands recognize a variety of classification systems for environmental zones within salt marshes. For example, the New York State Department of Environmental Conservation classifies areas where the short form of Spartina alterniflora predominates as belonging to the high marsh. But this activity and some other groups include it in the low marsh along with the tall form of Spartina alterniflora. See New York State DEC: Tidal Wetlands Categories for information on how New York State classifies areas within tidal wetlands. Similar techniques to those used in this exercise can be applied to other salt marshes and other natural areas. Of course, imagery should be obtained for the site that will be studied. Most states have GIS web sites that offer imagery that can be made into overlays in Google Earth. For example, New York State has a Geographic Information Systems Clearinghouse. This site offers aerial imagery in color for the entire state, and makes infrared imagery available for selected locations. States also have conservation agencies similar to the New York State Department of Environmental Conservation. These agencies often collect imagery that they use for research or regulatory purposes, and may be willing to share it with educational institutions, as has been the case in New York State. Conservation organizations, such as The Nature Conservancy also typically have imagery or data that they are willing to share. In other salt marshes, the same classification scheme that was used in this project can be applied, or the instructor could devise another system, provided that the specified environments can be recognized on the available aerial imagery. For other types of natural areas, a different classification scheme will need to be used. This can be developed by the instructor or can be a scheme that is used by researchers who have studied the site, provided that the environments can be distinguished in the field and on the imagery. The instructors work with the students in the field and on the computers as they collect, process, and interpret their data and create their maps. This provides ongoing opportunities to ensure that the students understand the material and techniques throughout the program. The students groups present their maps on Google Earth for the instructors and other participants during an oral presentation at the conclusion of the program, and the audience has an opportunity to ask questions. This provides additional opportunities to determine whether the students understand the work they are doing. The instructors ask questions to encourage them to think about the material as they are explaining their findings.